“We the people of the United States, in order to form a more perfect Union, establish Justice, insure domestic Tranquility, provide for the common defense, promote the general Welfare, and secure the Blessings of Liberty to ourselves and our Posterity, do ordain and establish this Constitution for the United States of America.” This famous sentence is the preamble to the U.S. Constitution. Learn more at the following sites. This section of Ben's Guide to the U.S. Government is part of the Historical Documents Learning Adventure. In addition to this page about the Constitution, Ben's Guide includes articles about the Declaration of Independence, Articles of Confederation, Bill of Rights, Emancipation Proclamation, and Gettysburg Address. Published for grades four through twelve by The Dirksen Congressional Center, Congress for Kids tells the story of the Constitution starting with the Constitutional Convention of 1787. "It includes information about the writing the Constitution, the Great Compromise, the Constitution's signers, the Bill of Rights, the Amendments to the Constitution and what they mean to Americans, and much more." In addition to the illustrated lessons, each section includes a related quiz or a game. "The [Constitutional Convention] delegates agreed that the Constitution would become law once it was ratified by nine states. New Hampshire became the 9th state to ratify the Constitution on June 21, 1788. On December 15, 1791, a Bill of Rights was added to the Constitution (its first ten amendments). 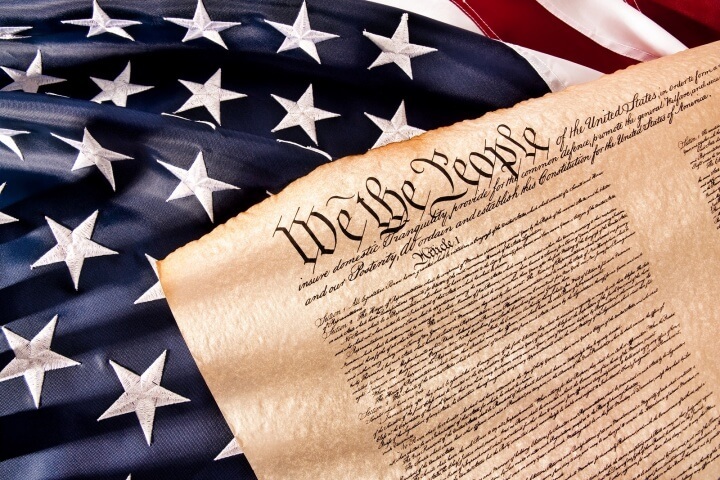 Today, the United States Constitution is the oldest written constitution. It currently has a preamble, seven articles (which describe Congress and its functions) and 27 amendments." Click on any of articles, amendments or framers (listed in the horizontal menu) for more. This history of the Constitution was written by Roger A. Bruns. "May 25, 1787. Freshly spread dirt covered the cobblestone street in front of the Pennsylvania State House, protecting the men inside from the sound of passing carriages and carts. Guards stood at the entrances to ensure that the curious were kept at a distance. Robert Morris of Pennsylvania, the 'financier' of the Revolution, opened the proceedings with a nomination – Gen. George Washington for the presidency of the Constitutional Convention." "The need for the Constitution grew out of problems with the Articles of Confederation, which established a 'firm league of friendship' between the states, and vested most power in a Congress of the Confederation." The White House explains why the Constitutional Convention was convened, the ratification process that followed, and how the Bill of Rights resolved contention between the Federalists and Anti-Federalists. Feldman, Barbara. "U.S. Constitution." Surfnetkids. Feldman Publishing. 28 Jun. 2016. Web. 20 Apr. 2019. <https://www.surfnetkids.com/resources/us-constitution/ >. By Barbara J. Feldman. Originally published June 28, 2016. Last modified January 17, 2017.